Short summery: This unique advent jigsaw calendar has 25 wooden jigsaw pieces, each depicting a part of the story of Jesus' birth. Each numbered piece can be attached to the last in any direction giving you an endless variety of shapes that can be made. Follow Gospels account of the birth of Christ from Bethlehem to the wise men. 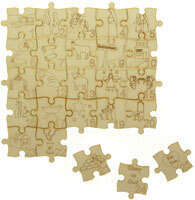 Each jigsaw comes with a print out detailing exactly what each square represents.